…Looking more closely at Alzu now, however, Zy was not so sure. Did he like this man? Well, liking was above Zy, really – he was the mere son of a sentinel, and Lord Kurososhora was from what amounted to a different world, the world of those with commanding and not obeying voices. Did Akzasosan like him – that was Zy’s ultimate method of judgement: did the Shion Suli like the Shion Alzu? And Zy wasn’t sure. There were certainly moments when the two men appeared to be floating closer to each other – dancing – and they had obviously discussed things of some importance to grown-ups, Zy could at least understand that. Kurososhora Alzu was certainly magnificent, and yet his magnificence was not (like Akzasosan’s) something internal, Zy sensed, something integral, but was less inherent, and less structural. It was true, even in the metallic brilliance of his shillo garments, the Lord looked less Xor than Alzu – less rich, less splendid. The plump and supple furs seemed to encase Lord Kurososhora in an armour more convincing and more impenetrable, somehow, than actual mail. But even the furs were slightly deceptive: Zy noticed now that the hem of Alzu’s coat was rather threadbare, as were the ends of the sleeves; and the sheen of the coat wasn’t even – there were patches where the fur appeared hardened and worn, and the hat looked a little motheaten. Moreover, the coat wasn’t fastened properly: one of the buttons, Zy spotted, hung on a long, loose thread. Still, Alzu was the most splendidly dressed person Zy had ever seen. But even this splendour didn’t quite run in complete accord with the picture Zy had of the man as a whole. Lord Kurososhora was really very thin – it was as if his bones had eaten away at his flesh, or as if his flesh was not, as with ordinary people, a vital part of him, but more a kind of afterthought. The shion’s skull was alarmingly present in the face – the shape of the bones, the sockets of the eyes, the teeth – Zy could almost see the bones, and the way the teeth were set into them, as if a light had shone on Kurososhora Alzu and flashed away the living tissue, revealing the basic skeleton beneath. His dark eyes – the irises were a deep brown, but the pupils were unusually large, for some reason, giving Zy the impression of glittering blackness – were shining shadows: they dwelt in the caves of the sockets, and gazed watchfully out. So thin was the face that even when looking forward, it seemed almost half a profile: and when the head was in profile, the cheekbone, brightened with a hectic flush – the only colour in the face – knobbled out at Zy, stared at him like a kind of blind, bony eye. The black pencil moustache, and the eyebrows, which also looked as if they’d been drawn on with a ruler, and the elegantly razored prongs of the sideburns, gave Alzu’s face an even more angular, cut-up appearance. So, the coat didn’t quite go with the body and head, but there was more, too: the manner didn’t quite fit with the man, either. The indolent drawl, facile and bored; and the aloof, amused languor – there was something else in there, Zy felt, something stirring and moving around beneath the surface of the man’s attitudes; and not only moving around, but moving against – kicking out at them, a little, or waiting, rather like a predator, to fall upon Kurososhora Alzu from the inside, to make him its prey, either by disturbing, or by completing him. 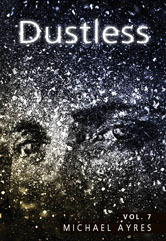 Dustless is a unique novel, almost 3.5 million words long. Less a conventional narrative than an open-ended literary world, it nevertheless pursues two main stories: the first, the journey of a group of riders across a vast empire; the second, the journey of one of those riders, a young boy, Zysoshin, into the infinite world of the mind, to a state where, ultimately, the imagination is able to construct reality.